Scrivener: a writing studio like no other. Most architects will be familiar with the concept of BIM. Basically, BIM software allows you to manage an entire building design mostly within a single app – so from a single 3D model you can get all the drawings, specs, details, everything co-ordinated and synced (I’m obviously grossly over-simplifing this; I’ll be posting more about BIM, one of my key areas of interest, soon). But the reason I begin this post with BIM is because I think I’ve found a writing tool that, in a way, mimics those organisational characteristics of BIM. 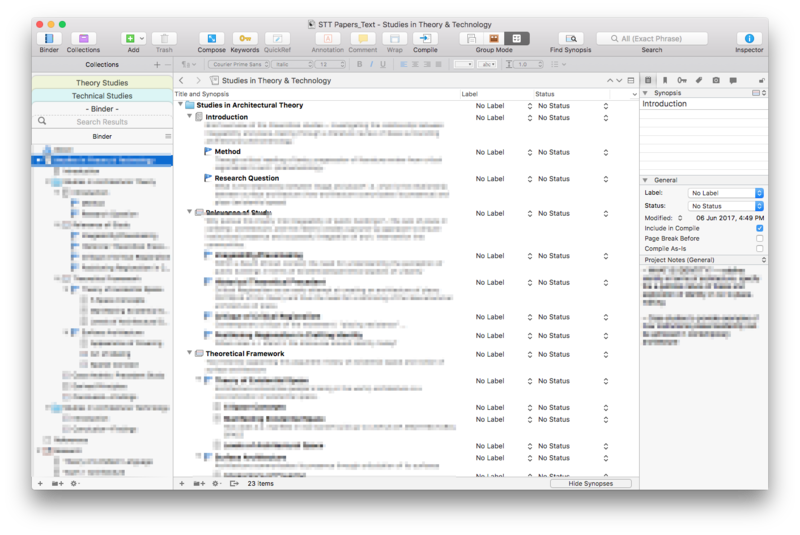 Scrivener is an app I’ve been using for years now to manage my writing projects. I still think it’s one of the best-in-class apps for managing monstrous writing tasks – of which the architectural design dissertation is such a beast. For architects (who are generally more visually-inclined), writing is indeed a step outside our comfort zones. Scrivener, then, is like a gentle friend that guides you through the treacherous waters of design research, writing, and data collation that are the three heads of the design dissertation Cerberus. Why bother with yet another piece of software when we’ve already got Microsoft Word to handle writing, I hear you ask? Well, where MS Word is a generally acceptable word-processor, Scrivener is a full-blown writing suite. With Word, you can get away with writing a short piece of text, like an essay. But navigating the long chapters of a dissertation – where there are thousands of words per section – can become extremely painful. You end up losing your place, you can’t always see the full structure of the project, your research has to live in a mess of folders… it’s a nightmare, in my opinion. Scrivener, by contrast, is like BIM software: you can choose to see either the project in its entirety, or you can break it down into its smaller chunks and work on the little details (scrivenings, in this case). One of the best things about it is that you don’t write everything in a single document; you have a Scrivener project, but this is actually made up of a series of smaller files, like text files (which become your manuscript), images, notes, even whole web pages that form part of your research folder. You organise things into folders (and it comes with a plethora of great project templates to get started; I’ve customised one of them to suit my theory and technical papers assignment in a fashion that works well for me). Then you can set up your structure, and this is what I really like about Scrivener: it gives you some great ways of organising your writing project into the various chapters and sections. 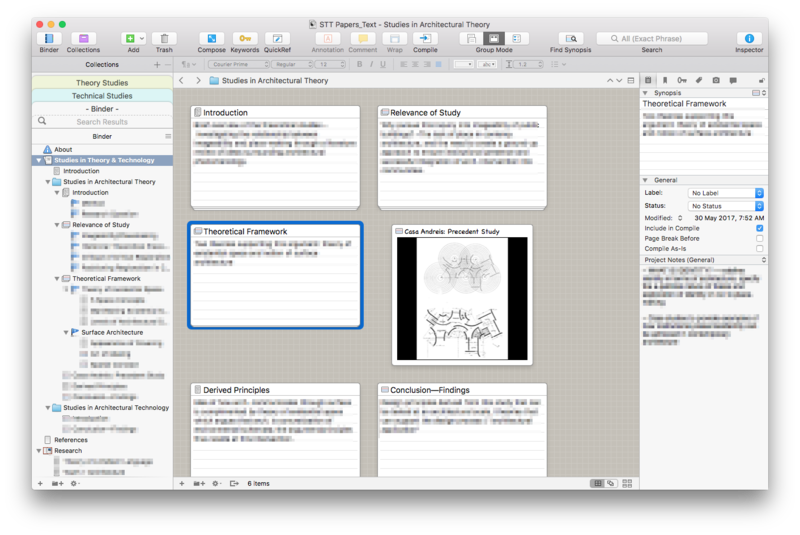 You can either use a virtual “corkboard” (like tacking a series of index cards to a board, but in the digital way), or a great outliner (which I used to put the structure of my papers together). Everything is organised on the left panel in what’s called the “binder” – think of this as a virtual ring binder that’s highly-organised and contains literally everything you need and are working on: your manuscript, that contains the chapters and sections of the dissertation, your research, images, web pages, ideas, quotes… it’s all there. The writing environment itself is great; there’s no distractions, and you can even go into a full-screen mode that dims everything on your desktop so it’s just you and the words on an empty, uncluttered screen. 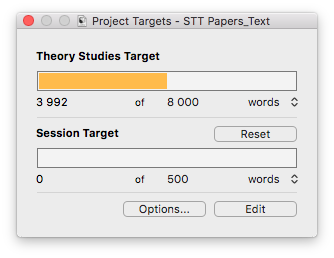 Scrivener also allows you to set project and session targets, so you can visually (hey, this one’s for you, designers!) track your progress. It’s a great feeling when you’ve reached your session target for the day, and often I find myself wanting to push further for that day, just to nudge closer to the final project target goal. I mentioned that architects are visual people; our written work reflects this as we’re expected to have images and drawings that are referenced in text to support our arguments. Scrivener deals beautifully with this: you can set an image as the reference for a card in the Corkboard view – which is great to get ideas flowing around a certain topic or case study. The binder-style organisation of Scrivener also allows you to keep maps and other images well-organised in folders. You can have these opened as “Quick Reference” windows that float next to your writing, so you can see them while you write. This allows you to stay focussed on the writing, and worry less about formatting and images jumping all over the place (something Word is notorious for). So how does Scrivener fit into an effective workflow for large-scale writing projects? I see Scrivener as a writing studio (much like a BIM authoring tool, where you use it to author the design, but then take that into other tools like Photoshop to further refine the presentation). With Scrivener, I can just focus on getting the draft done; it helps me to structure complex ideas and write in a non-linear fashion (so I can quickly jump between sections as ideas come to me, without worrying about intensive scrolling through thousands of words). Scrivener can export to a host of formats, including Word. What I’ve found, however, is that the formatting styles don’t translate very well.. For this reason, I’ve found some easy to use methods to get your draft out of Scviener, into Word, ready for formatting and bringing in to InDesign for page layout and presentation. The problem is that you need a Word file to bring into InDesign, and to ease the formatting hassle, your Word file should be correctly formatted with styles (headings, body text, quotes etc). This allows you to quickly apply the correct fonts and styles to different kinds of text. There’s a simple go-around for this: simply export form Scrivener using a custom compile setting (see below), open the resulting Word file, then run a macros (see below) that will automatically convert the Word file into the correct styles which you can use in InDesign later. Go to his website (link above), and download the compile setting for Scrivener; this is a .plist file that you can easily import into Scrivener at the Compile window. This will output your manuscript in a format that can be easily styled with MS Word styles (headings, body, quotes etc). Copy the macros code, following his instruction, and place it in the Word macros editor. (Macros is just automated actions, and in this case, the instructions you’re copying into Word will allow you to easily convert your Scrivener export to the correct Word styles). Run the Macros (Tools -> Macros -> Macros…, select “FormatScrivener”, click “Run”). Voilà! Now, all you need to do is go to the EndNote tab in Word, and turn “Instant Formatting” on. All your references will be correctly formatted baed on your selected referencing style; a bibliography is also auto-generated at the end of the document and you can even switch between referencing styles on-the-fly. How cool is that!? 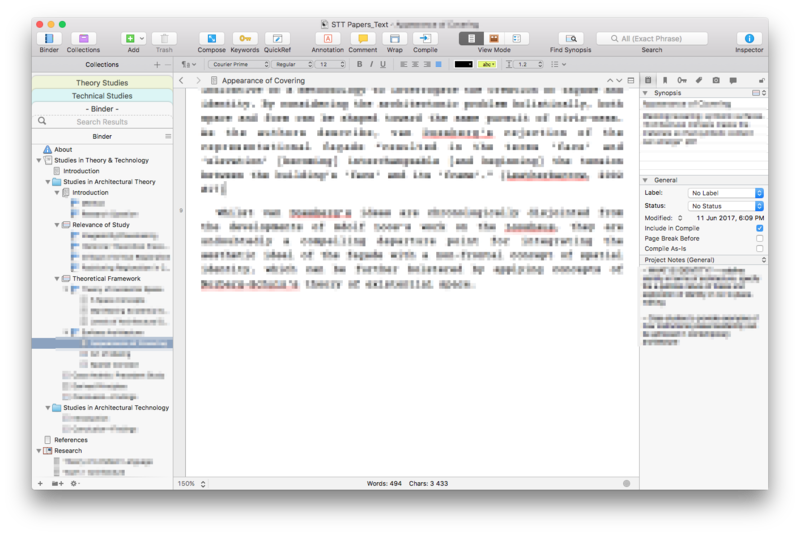 I really think Scrivener is one of the best tools out there to help navigate dissertation writing. It keeps you organised, and allows you to be flexible in how you manage such a large-scale writing task. Yes, my workflow might appear a little convoluted. But there is a method to this madness: Scrivener allows me to write the way I want to write, without the messiness and annoyances that come from working in Word. EndNote allows me to keep the referencing streamlined and organised, and everything comes together in Word, which is simply a go-between from raw text to the formatted product in InDesign. Scrivener is available for macOS, iOS and Windows; it’s well worth the $45, and there’s a free trial as well. It’s developed by the wonderful people at Literature & Latte – click here to find out more. Disclaimer: this is in no way a product endorsement of Scrivener; I’m simply a long-time fan of the software and thought it might be useful to any architecture students out there curious about ways to navigate design dissertation writing. I’m currently working on a mammoth project – a (possible) 70 000+ word manuscript for an action/thriller novel that I’ve been planning for a few months now. It’s a scary thing to think about, and so writers often need something to help get them through the process. F. Scott Fitzgerald had his (ahem) indulgences, as did many other writers including Oscar Wilde, who even imbued his famous character Dorian Gray with some of his own habits. For me, well, there’s music. Music is the perfect mood creator. It helps to set the imaginative landscape and gives the writer much-needed energy to put down words. And with a good pair of headphones and the right music, you can really create a cocoon for creativity. I’ve written on the subject of film soundtracks before, and in this post I’ll highlight my favourite pieces to listen to while writing such monstrous things like a first draft manuscript. Film and game music are designed to keep audiences engaged with visual content. And since, as writers, we’re creating visual scenes through the magic of words, these two mediums work beautifully with each other. Below are some of my favourite scores to listen to while writing. I should mention that, while I present these pieces in the context of writing, they’re suited to most creative tasks where a little mood music can go a long way. The soaring orchestrations and endlessness of the guitars set a beautiful sonic landscape for your words to flow. The deluxe edition has a brilliant “sketches” session, where Zimmer explores in a continuous mix the various ideas and themes that permeate the Superman reboot. M83 created an electronic-infused score to this Tom Cruise science fiction blockbuster. It’s very atmospheric with lots of rising strings and melodies that almost urge you onward to the next word, the next paragraph, scene or chapter. It’s an especially nice listen when you’re wanting for inspiration, at the beginning of a writing session, and gives your imagination a nice kick start. This is a soundtrack designed to help you focus. Since it’s scored for the (insanely cool) Assassin’s Creed games, it works really well when writing scenes of intrigue, action, or contemplation. I sometimes listen to this to get into the writing mood. In case you don’t know by now, I’m a huge fan of Hans Zimmer. He’s my go-to guy for a musical fix when I’m working on a creative project. The Dark Knight Rise score is powerful, with great highs and lows perfect for almost any kind of scene. And if you just want to feel inspired, the rousing chant from the movie certainly does the trick, as does Junkie XL’s remix “Bombers over Ibiza”. You can never go wrong with Lord of the Rings. The quintessential high-fantasy drama, its soundtrack is powerful, rousing, and the perfect mix for creating an immersive creative environment. The final tracks, with Enya’s ethereal voice singing in Elvish, is hauntingly beautiful. Skyfall is one of my favourite new Bond movies, and Newman’s score is a mix of electronic and classical, that’s perfect for action scenes and scenes that are particularly dialogue-heavy. It’s also great to listen to before sessions, to get into that mood (along with Assassin’s Creed and Oblivion). Bear McCreary is a genius. The theme for Da Vinici’s is written as a musical palindrome –it’s the same forwards and backwards. The rest of the score is good mood-setting music, in a similar vain to the Assassin’s Creed score mentioned above. Junkie XL is a rising electonic-based musician, and his score for the latest 300 film is action-packed with definite eastern accents that articulate the sequel’s plot line. “History of Artemisia” is my favourite track on this score. Where do I begin with Inception? Well, firstly: “Time” is perhaps the best Hans Zimmer piece written. Ever. In fact, watch it in the video below, performed live by Zimmer and his orchestra. It’s emotionally-charged, carefully crafted and powerfully executed. As is the rest of this score, one of my all-time favourite motion picture scores. Its subtle piano notes, contrasted by heavy brass and thunderous drums, create a highly immersive environment that helps one emotionally connect with their work, as with the music itself. It’s Hans Zimmer at his finest. (I might write a future post on the status of the above-mentioned manuscript. It’s going as well as can be at this stage and I’m getting closer to the midpoint). The art of blogging has come to define the paradigmatic shift in the web from a content-consumption medium to a dynamic, conversational sphere where ideas can be easily shared and everyone can own their slice of the Internet. Blogs have allowed us to write, share and discuss anything and everything, and their “coolness” factor in the early days of Web 2.0 caused many corporations to adopt them as a quick, informal communication method – a way of bridging the gap between brand and consumer, much like what’s happening in the Twitter world with a multitude of “verified” accounts from brands tweeting as a means of keeping their user bases engaged. Newspapers realised in the early days of blogs that print media and their online offerings were struggling to keep pace with emerging blogs, and if you can’t beat ’em, join ’em, right? Which is what they did. However, the actual art form has come under scrutiny for whether it’s a dying medium today. Certainly, with larger print houses there is a sense that readership of content-specific blogs are dwindling, along with technological shifts, that are dictating a move away from blogging and back to more quality-focused content production (rather than the rapid-fire, continuous stream that blogging enables). In other words, content-specific blogging on news sites is not performing as well as other content, perhaps because people are choosing to consume such content from titles that are blog-first (I’m one of those people; I subscribe to numerous blogs and keep up with the world primarily through blogs rather than traditional news outlets). I feel that blogging is an inherently personal medium. Whilst its power as a means of communicating in near-real-time with an engaged readership (and thus the ability to strengthen brands) is certainly appealing to companies, blogging has been described as “the unedited voice of a person” (by one of the form’s pioneers, Dave Winer). This post is an example of that. I had an idea, after reading Mathew Ingram’s post on GigaOm (one of my personal favourite tech blogs) about this very topic, to discuss, with my personal opinion, the current state of the blog. Thus, this piece is a sort of stream-of-consciousness, my thoughts arranged in bits and transferred to you through the magic of the Internet and WordPress. As an “unedited voice”, blogs offer anyone the ability to share their view of the world with the wider audience of the entire Internet. In this manner, I think that blogging will move back to basics, back to its roots as a personal medium. The growth of blogging software like WordPress, and the ease of use of such software in setting up a personal website, coupled with the rise of social media and the App Ecosystem will enable more individuals to express themselves through their own personal homes on the web. Whilst the major publishing houses like the New York Times choose to return to editorial-focused journalism citing content quality as a primary reason, blogging will continue to be the casual, conversational beast that is always has been. And this is the perfect thing that a platform of a personal nature needs. David S. Goyer is one of the most influential writers in film and television today. He’s responsible, along with Christopher Nolan, for reinvigorating the comic-book film adaptation scene with Batman Begins, and is the creator and writer for Da Vinci’s Demons (one of my favourite series on at the moment). Goyer is a brilliant screenwriter. His stories are compelling, action-packed and filled with enough gravitas to ensure dramatic tension befitting the nature of his iconic characters, whether it’s Batman, Leonardo da Vinci or Superman. In this lecture and interview with the British Academy of Film and Television, he talks about the craft, about his start as a young screenwriter, and his process on the Batman films, Man of Steel, Blade (for which he got his big break as a writer in Hollywood), Da Vinci’s Demons (and why writing for television is becoming more attractive for writers over films), and writing for video games. It’s an excellent video, very informative and entertaining. A must watch for anyone interested in the craft of screenwriting, films, comic books and television. So I have begun another novel project – what I like to term a “long-form writing endeavour” (primarily because it sounds fancy :P). This time around, I don’t want to fall into many of the traps that plagued my first attempt. I’ve been reading extensively on the art of story structure, pacing, character development and on the general craft of writing. Two authors whose books have been indispensable: Steven King (On Writing: A Memoir of the Craft) and Larry Brooks (Story Engineering: Mastering the six core competencies of successful writing). I actually began reading these books during the final few months of the previous writing project, and I’m hoping that the lessons I’ve gleaned from those books will help guide me on this next writerly journey. I thought I’d share a few things I’ve picked up along the way, especially at this phase of the project. Right now, I’m in the earliest stages of planning this thing. This is a rather delicate time for the project. Right now, it’s little more than an idea, so it needs nurturing to convert that wisp of thought into something more tangible. The problem with writing – especially with mammoth projects like novels – is that there isn’t anything to hold you up; there’s no structure like a formula into which you can plug in some variables, hit “Enter” and bam! an answer is churned out. No. With writing, the writer needs to first design that structure before even beginning the piece. What’s interesting with both King and Brooks is that they each have a unique take on how the writer should work; they each represent the two major groups of writers: the plotters and the pantsers. Plotters (Brooks) meticulously plan out the story, developing a coherent structure and definitive points, understanding almost all the variables of the story before a single word of the manuscript is actually written. In contrast, the pantsers (King) write “by the seat of their pants” (hence the name), writing as the words take them. Being the diplomatic person that I am, I think each has its merits. But I like order, I like structure, I like working from a framework. Before all this, before I learned about this distinction, I began my first few novel attempts without any structure. And now I think it’s time I did this in a method that will ensure my wisp of an idea can walk a more tangible path to its realisation as words in a manuscript. So I’m going with Larry Brooks’ methods as outlined in Story Engineering. It’s not meant to mechanise the art of writing, but rather to enhance it, and to ensure that I keep to this thing. By having a structured plan, I know what’s going on in the overall arc of the story, I know which characters are doing what, and there’s no need to invent arbitrary things that often are done out of need to detract from the task at hand (as with my previous project). At this stage, I’m working on a beat sheet. This is the basis for an outline. All my scenes are bulleted in a document in Scrivener, and from here I can have a birds-eye view of the whole story arc. I see my plot points and pinch points, and know exactly what my main character is doing. Plot points are the major events, the checkpoints along the hero’s journey; pinch points are the subtle reminders of the antagonistic force impeding his quest. This project is exciting for me for a few reasons. Firstly: it’s the first long-form project I’ve embarked upon since my previous work, which had me occupied since 2009 (with many false-starts and rewrites before I even got to that first draft). So it’s a nice, fresh start. The idea is exciting, too, and is vastly different from what I’ve done before. It’s new and refreshing and gives me some much-needed vitality to kickstart such a long-haul voyage. Secondly: I’m writing it in first-person present tense. I’ll probably write another post about this technique soon; it’s something that’s quite compelling, and which I admired in The Hunger Games. This means I’ll be exploring narrative writing from a vantage I haven’t done before… and then there is, of course, the fact that I’ll be doing this from a structure that will truly guide me along the way. This notion of questioning why we – as people who create things, imagine things, build things and dream things – do what we do, has been playing around in my mind for a while now. Why is it that we push ourselves in this way, warp our minds into the worlds we dream up, stay up late into the early hours of the cold morning still toiling away at our keyboards, drawing boards, tablets and canvases? Indeed, there is a fire that burns within the creator, the maker of art and literature and poetry and those things that make life worth living for. A burning desire to shape reality to the whims of our imaginations, to concretise the wisps of thought. We’re compelled to see our ideas through to their ends; we’re driven by passion, I guess you could say. This quote from one of my favourite movies, Dead Poets Society, is perhaps the best way to capture the essence of why some of us prefer to stay up in the solitude of the night, not dreaming but gently luring those dreams into the cool air of this world. … the human race is filled with passion. And medicine, law, business, engineering, these are noble pursuits and necessary to sustain life. But poetry, beauty, romance, love, these are what we stay alive for. To quote from Whitman, “O me! O life!… of the questions of these recurring; of the endless trains of the faithless… of cities filled with the foolish; what good amid these, O me, O life?” Answer. That you are here – that life exists, and identity; that the powerful play goes on and you may contribute a verse. That the powerful play goes on and you may contribute a verse. What will your verse be?